This is the most important week in the Christian year. Passion Week and Resurrection Sunday are together four awesome holy days, filled with the primary symbols of Christian faith. The four days unite all Christians — Maundy Thursday, Good Friday, Holy Saturday, and Resurrection Sunday. And each of the four holidays has profound, powerful symbols that should unite all Christians, too. Maundy Thursday is powerfully represented by the Lord’s Supper — which we also call the “Last Supper,” the “Communion,” and the “Eucharist” [i.e., Thanksgiving]. Together we recognize the Body of Christ both as his Body is represented in the bread and also as his Body is depicted in a united Church — locally and internationally — joined in celebration of Christ’s gracious gift of himself for us. Whenever we eat or drink, we remember the Lord Jesus Christ and the difference he makes in all of us who partake. Maundy Thursday also includes Jesus’ washing the Apostle’s feet. The Towel-and-Basin are together, therefore, a powerful symbol of the kind of servant leadership that Jesus repeatedly taught and exemplified — and the servant leadership he wants practiced by all his followers. Since some churches do not practice this symbol, it is perhaps less unifying. However, for many groups — including very liturgical churches such as Roman Catholic and Eastern Orthodox Churches, as well as groups more spontaneous in worship such as Anabaptists, Adventists, Baptists, Charismatics, and Pentecostals — ceremonial foot-washing is a treasured symbol. In fact, numerous Baptists consider the ceremony of foot-washing to be their third “ordinance,” along with Baptism and the Communion. Good Friday is especially well represented by the Crucifix — literally a “cross with a body fixed to it” — perhaps the most well recognized symbol of God’s amazing Grace and of passionate Christian faith. The amazing Divine choice to suffer for us is one of the radical differences between the Gospel and world religions. Just think of the splendid paradoxes involved in our worshipping the one who voluntarily chose to pour himself out so completely for us. Such grace-filled paradoxes are so intensely Divine that even elevated human-made religions cannot imagine embracing. I love the point in the conversation when a Muslim or Hindu friend says that their “god” — Allah or Brahman — could never sacrifice himself for us. They assert that it is impossible for “god” to become human in the first place, and doubly impossible for him to then die for us. What an opportunity we have to then point out that the God of the Bible must therefore be greater than Allah, because he not only became a human, he died as the eternal sacrifice for us, and then he conquered death itself, rising from the dead. He is the only Master of Death and Life. And the Crucifix is a bold symbol of that liberating truth. Holy Saturday is then represented in the empty Cross, also very prominent and powerful symbol among Christians. The plain Cross reminds us that Jesus Christ’s work as our sacrifice is complete. His dead body was lovingly taken off from the Cross and placed in a borrowed tomb in time for the beginning of the Hebrew Sabbath. Like that Hebrew Sabbath, the empty Cross is a symbol of the priceless peace and rest that God’s amazing grace empowers. When Jesus said on the cross, “It is finished,” this was a statement of victory. Jesus in one day completed the painful sacrificial work that humanity had needed from near its beginning. The devil and Jesus’ opponents may have wanted Jesus to say, “I am finished.” However, that was never true – and his victory was made even more evident on Resurrection Sunday, the next morning! 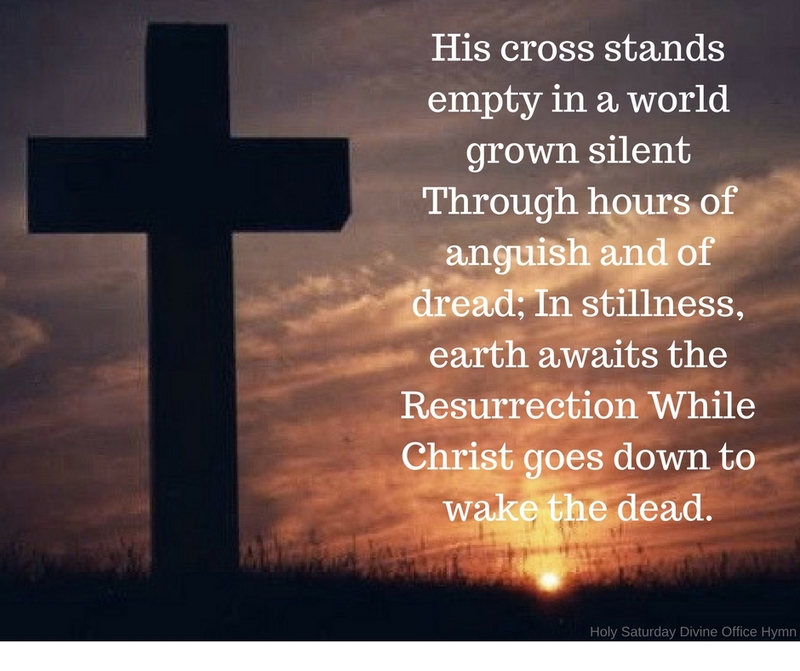 Nevertheless, the empty Cross itself is a passionate symbol of profound Divine victory – reminding us that on Holy Saturday Jesus rested in the grave having then completely paid the penalty for our sin. Resurrection Sunday is symbolized in many positive ways — including bright-colored clothing, flowery hats, intensely joyful singing, and stunning depictions of a radiant, vibrant, living Lord Jesus Christ. Perhaps some drama and movies can symbolically communicate the renewal of life and life-giving power of Resurrection Sunday — but so can some of the ancient icons of the resurrected Jesus. Those Icons are intentionally not representational or pictorial — and they certainly are not idols — but they are richly symbolic statements of the joy and power of Jesus Christ’s resurrection. While the Eastern Orthodox Christians make the most use of those Icons, many other Christians have also understood and embraced their meaning. Moreover, Baptism in all its forms can be a testimonial reenactment of the Gospel story, especially symbolizing the Resurrection power of new life made possible by Jesus’ amazing victory over sin and death on Resurrection Sunday morning. It remains deeply disappointing and puzzling that some Christian groups use just one or two of this rich treasury of powerful symbols of Maundy Thursday, Good Friday, Holy Saturday, and Resurrection Sunday. Many believers seem to be distracted by the connotations that some of these potent symbols belong only to Christians of other denominations. But how can any relevant, vibrant symbols of the Gospel be divisive? Especially given Jesus’ profound unity prayer that he voiced sincerely that first Maundy Thursday, we should design and create ways that we can unify over these awesome powerful symbols. I propose that the Lord’s Supper, the Towel-and-Basin, the Crucifix, the Empty Cross, the Resurrection Icons, and Baptism are all gifts of God’s grace to all of us. Each of these symbols powerfully celebrates the unique actions of the One, the Living God, the God Most High — who achieved what no alleged god could do or would do. Now, by God’s amazing grace, we can do much better in uniting together for God and the Gospel. And these great symbols of four special days will keep inspiring us.